Discussion in 'Amps and Cabs' started by vbf, May 2, 2016. Here's a pic of my very humble group of inexpensive amps and cabs, minus the the DSL40 that I keep at the practice space and typically gig with. I've never had the coin to buy the upper-crust amps so play in the inexpensive sandbox. I envy you gents that can afford the high end amps, but on the other hand, I've never been boo'd off the stage for playing this stuff. Nevets, clamflatslim, Leonc and 23 others like this. Looks pretty solid to me. Russ73, redeyedjim, pbmw and 4 others like this. clamflatslim, Abram4235, pbmw and 6 others like this. Nice collection. You don't have to spend big to have great tone. pbmw, vbf, Custom50 and 3 others like this. vbf, Phletch and motokev like this. That Peavey Classic 20 mini head is awesome! If I hadn't found a mint Fender PA 135 (all original tubes) for $200 nearby I was looking at that least beast. Really liked that it had 3 power levels, 20, 5 and 1. But it would have been (with speaker cab) 3 times the Fender, and I'm getting a guitar and bass rig together (my intention the whole time), and will have 1 of the channels voiced for guitar, possibly jumpered into another, a channel optimized for bass and one left alone. Of course, I had to get speaker cabinets, and an attenuator, so in the end I'll be spending a few hundred (or more) in addition to the 2 bills I dropped on the amp. that little peavey 20 is a great sounding amp. I might get one soon. 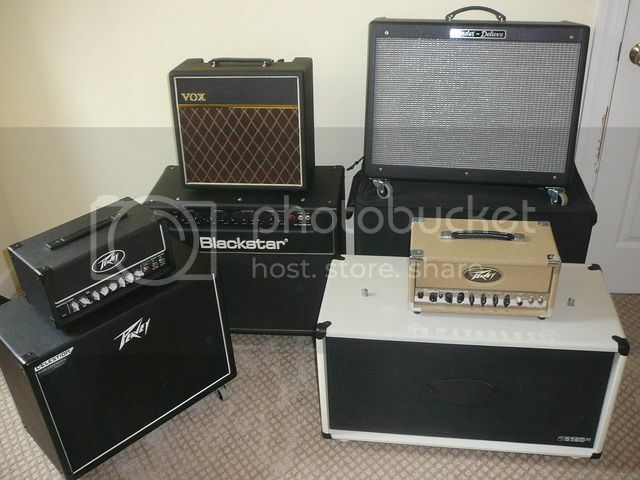 I need to sell some pricy amps first. RussB and vbf like this. All the bases are covered. Well done, vbf! Shows that you are a versatile player, too. Nice collection! It's not the price of the amp that counts, it's the amp's value as measured by you alone. For those who disagree, it may be wise to re-read "The Emperor's New Clothes." Which Blackstar is that? I'm with you in the bargain basement but love what i have. Millo 3.1, Crash-VR, GT100 and 2 others like this. Nothing wrong with that ! Nothing wrong with some cheaper stuff at all. Especially from Peavey, they make some good sounding stuff. All that matters is that you're happy, and you get a good tone out of it. The player makes the amp come alive. While I don't have any opinion on your amps, from a money management standpoint, I would say given that you have *6* amps and two cabs, saying that you never had the coin to buy an expensive amp is not true. You likely have never made it a priority, would rather have a variety of inexpensive amps than a single expensive one, never had the willpower to hold off, or some other reason, etc. But you clearly spend enough on gear that you could have an expensive amp. When I think about all the time and money I spent piece by piece, collecting and flipping cheap stuff when I was 'poor', honestly, I could have held back and got the stuff I *really* wanted sooner rather than later. More income is not always the answer. Not judging. If that is the stuff you dig, more power to you. But if you lust after expensive stuff and own piles of cheap stuff, I'd suggest rethinking your resource management strategy. That's right, I've never had anyone come up after a gig and rag on me about the gear. The playing? Well, maybe. Amen to that. Those are good amps OP, enjoy 'em! Instead of buying 2-3 of these, you could've gotten a nice used pretty high end piece of gear. Life's too short, just get what you really want to play. You might even end up saving money in the end. talentless hack, Crash-VR, vbf and 1 other person like this. If you're into cheap gear that sounds great, check out the Bugera V22! I'd take it over anything you have there! But that's just me. I'd also suggest you not worry about what other people think and just do your own thing to the best of your ability. One thing I've noticed about gear is, the better the gear, the worse the band, assuming the band is made up of people over 21. A lot of time you'll see bands made up of high school kids playing cheap gear that sound like crap, but they're young. We were all there at one point. In time, they might become pretty good. But generally speaking, whenever I see a band of adults load up on stage with boutique gear I know the songs are going to be boring, performances uninspiring, and the tones will be bland. Generally speaking, serious and gifted musicians don't worry themselves over fancy gear. The fancy gear owners are usually people with good paying day jobs that just enjoy playing a little guitar on the side or are working on a vanity project. And there's nothing wrong with that. You can count me in that category. But the best musicians and best bands usually seem to play mid level, mass produced gear. They know that it's not the name on the guitar or amp that matters. It's the name of the guy or gal holding it. Anacharsis, H. Mac, clamflatslim and 4 others like this.